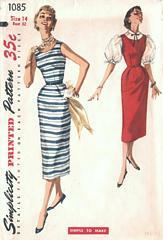 Vintage Simplicity pattern 1085 from 1955. Sheath dress or jumper with low rounded neckline. Slim skirt is softly pleated at waistline in front. Back kick pleat. 14" side zipper. Blouse has small collar and full, puffed sleeves. Self fabric or purchased belt.